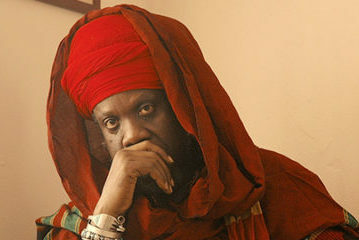 Mutabaruka (formerly Allan Hope) was born in Rae Town, Kingston on 26th December 1952. After primary education he attended Kingston Technical High School, where he was a student for four years. Trained in Electronics, he left his first job after about six months and took employment at the Jamaica Telephone Company Limited. During his time at the Telephone Company he began to examine Rastafarianism and to find it more meaningful than either the Roman Catholicism of his upbringing or the political radicalism into which he had drifted. In the late 1960’s and early 1970’s there was an upsurge of Black Awareness in Jamaica, in the wake of a similar phenomenon in the United States. Muta, then in his late teens, was drawn into that movement. Illicitly, in school he read many “progressive books” including Eldridge Cleaver’s Soul on Ice and some that were then illegal in Jamaica, such as The Autobiography of Malcolm X. Muta saw himself as a young revolutionary. But when he deepened his investigation of Rastafarianism, which he had once regarded as essentially passive, he came to find its thinking more radical than that of the non-Rastafarian group with which he had associated. While still employed at the Telephone Company, he stopped combing his hair, started growing locks, altered his diet, and declared himself Rastafarian. A number of his friends thought he was going mad. Muta was the first well-publicized voice in the new wave of poets growing since the early 1970’s. They have developed a living relationship between a poet and a fairly wide audience such as, in Jamaica, only Louise Bennett has achieved before them. Early work by Muta regularly appeared in Swing, a monthly that gave fullest coverage to the pop music scene. Introducing Outcry (March, 1973) John A. L. Golding Jr. wrote: “In July 1971, Swing Magazine published for the first time a poem by Allan Mutabaruka…Our readers were ecstatic. Since then, and almost in consecutive issues, we have derived much pleasure in further publication of this brother’s works… They tell a story common to most black people born in the ghetto… And when Muta writes, it’s loud and clear.” That his poems in Sun and Moon (1976), a volume shared with Faybiene, are quieter is one indication of Muta’s particular development. Like Louise Bennett (and like many of the Black Americans of the sixties whose work they had sampled) the new and popular Jamaican poets write mainly in the unofficial language of the people, feel close to Black musicians (to whom they sometimes allude), and make good use of opportunities to perform. I can still vividly recall the pleasure of hearing Muta read the Creative Arts Centre in the early 1970’s. He more than holds his own in the company of other skilled performers such as Mikey Smith and Oku Onuora (formerly Orlando Wong) with whom he has recently shared programmes. But though, like the others, he is on intimate terms with reggae lyrics and he sometimes does angry poems. Muta resists the label of “dub poet” as much as “protest poet”. Each, he feels, refers to only one aspect of his work. Granted that many of Muta’s poems are fully realized only in performance, some of them seem to me far more successful than others. My own favorite is “Nursery Rhyme Lament” which, I am told, is now discussed in some of our schools. In “Dan is the Man in the Van”, the famous calypso song by The Mighty Sparrow, British nursery rhymes taught in colonial schools are pilloried as absurdly irrelevant in that context; in Muta’s “Nursery Rhyme Lament” they are distorted into local meaning, they are reworked as history into the patterns of harsh reality – water rates, light bills, overpopulation, meat shortages and so on. The poem (especially when performed) is very funny; and deadly serious in the criticism it implies. Another special favorite of mine is “Revolutionary Poets” – “revolutionary poets/have become entertainers” – with its multiple ironies, including some that surely touch that poem itself. If few of the other pieces in this volume seem as fully achieved as these, this is, after all, a collection of “the first poems”, in which the voice of the young Mutabaruka speaks to and for a host of troubled young people.